Curtains sewn: nil.... Oh dear, finding the motivation for those curtains is proving difficult! But since they are mainly to keep the warmth in the house during winter, I have a good 6 months to get them done. I made my usual size 40 to fit my hips, but should have taken it in a bit more at the waist because it seems a bit big. But I like pulling my skirts down to sit low on my hips anyway, so it's just fine for me. The pattern is pretty simple, although the front waistband panel with the buttons is openable even though there is a side zip, and the method for attaching them is a little clumsy and messy on the inside. But no one can see the inside and only a sewist would care about such a thing really! Well it's been a really long week this week and I'm looking forward to a little quiet time on the weekend when my husband will be home looking after Anna. I think I should install a little daybed in my sewing room, 'cos I need a nap or two this week! After slowly catching up my missed sleep from my insanely late night out, Anna has been very unsettled due to her teeth I think. Last night she was awake from 9.30pm to 2.30am (eek! ), and would only stop crying if I held her. At one stage when I had absolutely had enough I gave her some baby nurofen, wrapped her really tightly and let her cry herself to sleep in her cot, but after an hour she was still screaming so in the end I had to rock her to sleep over the next hour. And this morning no teeth still! I can feel them in her gums but they haven't popped through the skin yet. Anonymous - I think this dress would work really well with an a-line skirt, or any style of skirt for that matter. I'm thinking about making this dress again in a cotton for day wear with a less severe pencil skirt style. While there is plenty of room around the hips because of the pleats, the skirt is very narrow around the knees and definitely needs the two side slits to make walking possible. 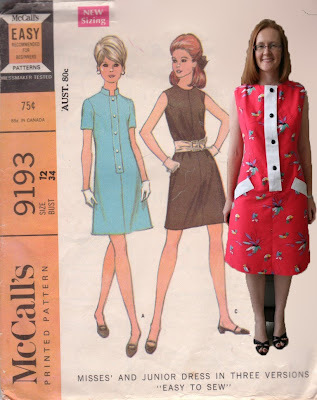 Gail - there are a few reviews of this dress over at Pattern Review in addition to SewTawdry's fitting and crafting tips which are really helpful because as usual the BWOF instructions are not so helpful. That said though, once you've worked out how to sew the side pieces to the bodice pieces it's all pretty straightforward after that. katherine h - oh no! As Sew4Fun said, special night outs don't come along too often after babies so I'm so sorry yours ended short with you being sick. Jean it's funny you should mention making a fabric alphabet letters for your grandkids because I've been doing the exact same thing for Anna! A contest of scrap busting ideas is being held over at Sew Mama Sew!, including a tutorial for padded letters with magnets in them to put on the fridge, so I've been gathering little squares of fabric and tracing the letters to make two sets (since Anna's name has two A's and two N's). Not that this has made the tiniest dent in my fabric stash, but it's fun anyway. There's heaps of tutorials for using up fabric scraps, my favourites being the one for drink coasters made from old CDs, a ladybug pincushion, a fabric brooch and a yo-yo necklace. I'm sure you're all like me and have scrap bags that are as out of control as your fabric stashes, so it's worth a look at all the fun ideas. Well I've been playing around with my new machine and I just love it! It is so quiet and just does everything with ease so I am definitely happy with the purchase. Haven't sewn a stitch of curtains yet (or even unrolled the fabric from the roll for that matter), but I have nearly finished a skirt for myself where I made keyhole buttonholes just because I can now, and a pair of shorts for Anna using a decorative stitch around the hem again just because I can, and I made myself a fancy dress using super slippery fabric that was no problem for this machine. My mother's group had planned a night out sans babies and husbands for cocktails and dinner in the city on Friday night and since this is a rare and hence very special occasion for me I decided a new dress was in order. In fact, a new dress using some red and pale gold floral patterned silk satin fabric I bought from the Remnant Warehouse a few years ago and was waiting for the right pattern to come along. You know those fabrics that are too beautiful to cut into for just any old thing? When I saw BWOF 5/09, dress 117 I knew it would be just perfect for this fabric. I even made a muslin out of some fugly satin fabric I had in the stash to get the fit right, which I'm glad I did because the skirt is super long and has a lot of ease in it due to the pleats so I ended up cutting a size smaller for the skirt than I normally would for a BWOF. Doing the muslin was also good to practice sewing the unusual kimono style sleeves on the front. Even with practice though they were majorly fiddly and the points still didn't turn out perfect on my finished version, but I don't think it's overly noticeable since they are in the folds of fabric around the armpits anyway. Thankfully Audrey over at her blog SewTawdry (tee hee, I love that blog name!) had put together a tutorial on this dress which was of a great help, and her version is just gorgeous. I underlined the silk satin fabric with some organza I also had in the stash to give it more body and to have something to hand sew the hems down on to so they wouldn't show through to the outside. This is what made it difficult to sew actually, the layers kept slipping and sliding and needed a gazillion pins to keep it in place. But again I think it was worth the extra effort because it reduced wrinkling too, even after a looong night out it was hardly wrinkled at all. So I got sucked into the 20% off everything sale at Spotlight yesterday, and a $1000 later I got out of there! But I don't have anything I need to squirrel inside and hide from my husband since he was there with helping me carry the purchases, luckily 'cos I don't know how I'd explain that figure on our credit card bill! Yesterday morning my husband had a molar tooth extracted, and after I convinced him to take the rest of the day off work I dragged him to Spotlight to buy some curtain fabrics I had finally decided to get. After seriously considering buying some curtain fabrics that were around the $50 a metre mark (bearing in mind I need 27 metres), I saw some very similar patterns in Spotlight for only $16.95 a metre. But being the tightwad I am, I knew if I waited long enough that Spotlight would have one of their frequent 20% off sales. So that was the reason for going to Spotlight in the first place, 27m of fabric and curtain tape were purchased and we were about to head out when my husband says 'why don't we look at the sewing machines?'. Clearly the pain killers the dentist had given him had gone to his head, or he's planning a big purchase himself shortly (new golf clubs perhaps?). But who am I to not jump at the chance. which has 70 stitches (68 of which I'll probably never use LOL), including a one step buttonhole and 7 buttonhole types to choose from. Yay! My buttonholes should improve dramatically now. It also has an automatic needle threader, and a fancy function where you can start and stop sewing by pressing a button on the front instead of using the foot controller. So if one day for some reason I can't use my legs I'll still be able to sew (there is a silver lining to everything). I stuck with the Brother brand for no particular reason other than my current basic one has given me no problems over the years despite never being serviced, and I have bought a few extra presser feet so I figured if I bought the same brand I would be able to use them still (here's hoping they fit). Since I don't do embroidery or quilting I just needed a good mid-range sewing machine. Yes, you read that correctly - I have made something entirely new and not a finally finished UFO either mine or inherited. A few weeks back we had some extremely hot weather, which although it has now disappeared and it's actually rather chilly for early spring I thought it was about time I started making some smart casual clothes for summer. Going through my wardrobe I realised the majority of my clothes are quite dressy, or they are really manky not fit to be seen outside in. So to fill the hole, I turned to trusty BWOF and have traced off some skirts, tops as well as the bermuda shorts from the 6/09 issue (view 120b). Even though I usually wear knee length shorts, I thought baggy, paper bag waist style shorts to the knees might look like they belong only on a golf course. So I made these according to the pattern but to my surprise they didn't turn out as short as I thought, in fact they are a good in between length. I did leave out the in seam pockets though, same reason as usual - trying to avoid extra bulk in my widest spot. These days I'm always carrying around a bag, and it's not like I can fit all that I carry in my pockets any more. I also left off the belt loops purely because I was too lazy to turn another linen tube after doing those tabs. Speaking of the pull tabs, I didn't have any buckles so I used d-rings instead. I couldn't work out why the tabs turned out a bit too short and are only just long enough to put through the rings, until I realised I made the front tabs from the underlap piece that was supposed to be used for the zipper, and not the pieces I cut out for the tabs! So they look a bit funny this short, and I am considering taking them off and re-doing them (although I probably will procrastinate on that until next year). I used the Sandra Betzina tutorial over at the Threads website for my zipper and ignored the BWOF instructions all together. In fact I only glanced over the BWOF instructions which might explain why these were so easy to sew. Although it would have been helpful to look at the instructions before sewing the darts and pleats, because those tabs get inserted into the folds of the darts on the back and the front pleats, and I had to unpick mine to put them in! It's no secret that I am prolific at creating UFOs (unfinished objects). But now I realise I can't fight genetics: when I was putting away some fabric I inherited from my gran I came across quite a few UFOs, and my mum, even though she doesn't care to admit it, has her fair share of UFOs as well. The last thing I need are more UFOs of someone else's making to add to my ginormous to do list, and since my gran seemed to have a fancy for shiny plastic fabrics, I was happy to shed most of hers. However, she had started this one dress made from a lovely textured cotton that had been basted into a loose fitting shift so I decided to finish off. This must be at least 20 years old or more, because I certainly don't remember my gran wearing dresses or when she was a large lady, but this dress was so large that I was able to cut a completely new pattern from it, so I guess in a way this is a refashion as well. 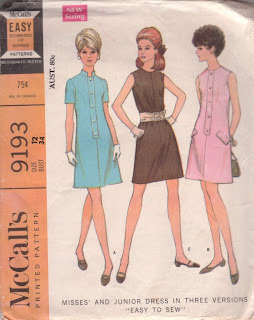 I've made my dress from a 1968 McCalls pattern (McCalls 9193) which is a misses shift dress. I chose this pattern because not only is it in my size (yay, no more grading headaches!) it also appeared to be front opening so I could wear this dress during summer while I'm still breast feeding Anna. However what makes this dress "easy to sew" is that the button front band and those pockets are fake, as in they are just top stitched down, which is of no use to me. Easy fixed though, I just sewed the front seam closed below the band, and attached the band to one side of the dress by wedging the dress fabric between two layers of the band and then top stitching it to the dress, and putting an extra band of dress fabric on the other side to sew the buttons on to. I did top stitch the bottom of the band to both sides of the dress though, just to keep it neatly closed. Some buttons from the stash (which is why there are only four buttons and none on the pockets) finished it off. I also added some darts to the front and back, and also took in a few inches at the back seam to add shape because this dress was very shapeless and a bit potato sack looking. The dress only had one dart, which is weirdly placed halfway down the armhole that points downward, which is the first time I've seen a dart like that. I'm thinking maybe because this is a misses pattern and pattern makers in those days thought young girls don't have busts to shape around,but are flat chested (which I practically am now). Because the vertical dart I sewed on the front came close to the end of the weird dart, I decided to join them up in a faux princess seam, ending at the pockets. Some more fakeness for you, but it actually looks pretty good.